Bubby and Bean ::: Living Creatively: orange you glad? I decided that I needed to escape my comfort zone today, and brave a little venture into the realm of orange. It's not that I don't like orange. Orange can be quite lovely. It's just that I tend to be a yellow/gray/red kind of girl (with a little turquoise/seafoam thrown in for good measure). Today, however, I pulled a forgotten orange dress out of the darkest depths of my closet, and am giving poor little orange my full, undivided attention. 1. Stunning photography by Ailera Stone 2. Pretty orange lips from Marc by Marc Jacobs Spring 2011. 3. Kinda amazing knit necklace by Charm and Chain. 4. Chic Simon Page 'Amaze' poster. 5. Cheery pinwheel flower curtains from Anthropologie. 6. Super modern Nelson Ball clock. 7. Cute as a button owl cookie jar from Anthropologie. 8. Fabulous vintage Orange amplifier (the guitar player in the band my fiance works for uses one of these for his practice amp!). Is it really Monday already? Sigh. Have a lovely day, darlings. That owl cookie jar is too charming! orange is a bit out of my comfort zone too, but I love this! orange u glad i didn't say banana? the amp, the amp, the amp. "the darkest depths of my closet" is my favorite line. I'm not usually much of an orange person either but you have a way of making everything look pretty! :-). I love the curtains and maze poster!!! 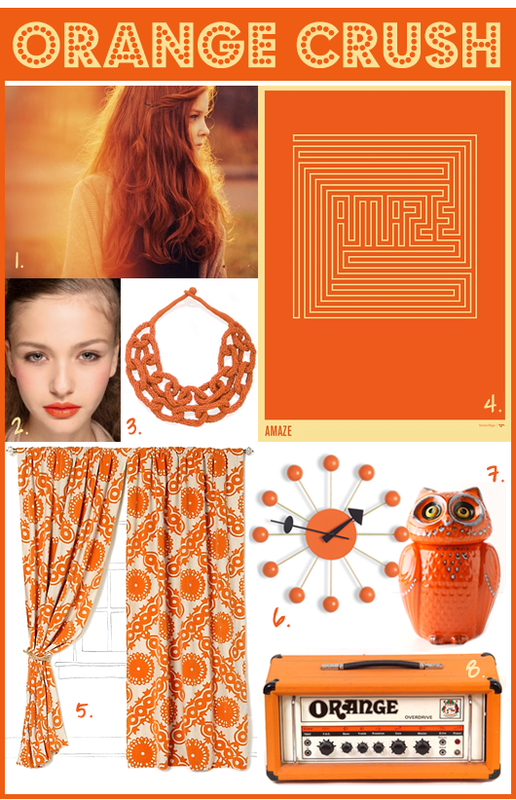 Oh I love love love Orange! I had an orange purse for several years that I finally had to retire because it was so worn. Orange usually makes me quesy.....This is one of those rare occassions that surprise and delight me! I love that collection, and that first picture most of all! I go to Clemson University, so at least half my closet contains orange :) Definitely one of my favorite colors, even on non-football game days! Oh, I love the color orange! Such a yummy collection you put together. Total eye candy! im feelin the orange lips!